Precipitation will struggle to move into the Finger Lakes, but if it is successful, it could lead to some icy travel conditions early Sunday morning. High pressure over the Great Lakes is preventing the northward progression of a large storm system over the southeastern United States. Precipitation will work hard to move north over the next 24-36 hours, but how successful it ends up being is questionable. 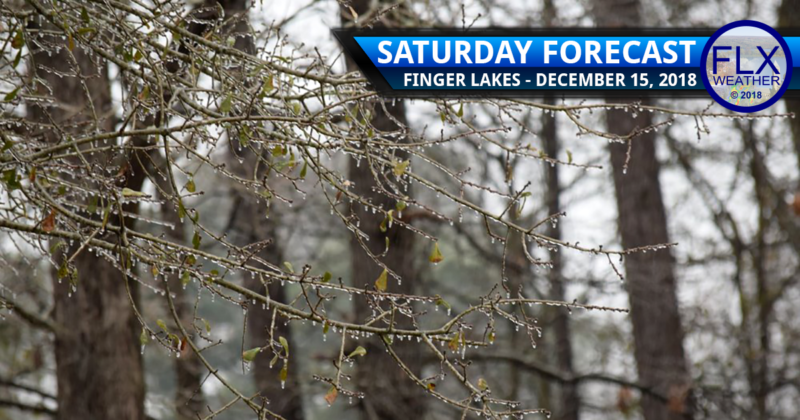 Saturday will remain a cloudy day with a couple shower or areas of drizzle. These will be most likely across the Southern Tier. Temperatures today will reach the upper 30s to near 40 degrees, so precipitation will remain all rain. By Sunday morning, low pressure will be along the coast of Delaware while the high pressure will be over Maine. Precipitation will continue to attempt to move into the Finger Lakes. During this time, temperatures at the surface will be below freezing with morning lows in the mid and upper 20s. However, there will be warmer air aloft. If precipitation makes it north of the NY/PA State Line, some freezing rain will be possible. This could mix with sleet or snow. The exact precipitation type is very uncertain. Any precipitation that works in Sunday morning should be light, but even a glaze of ice can make travel difficult. The National Weather Service may issue Winter Weather Advisories later today if confidence rises in an icing event. In my opinion, it is best to prepare for the possibility of icy pockets through the late morning hours Sunday. Hopefully the precipitation fails to move far enough north though. The potential also remains for a period of squally weather on Monday as a cold front moves through. The timing, intensity, and likelihood of such an event is still uncertain. I’ll have another quick update early Sunday morning. 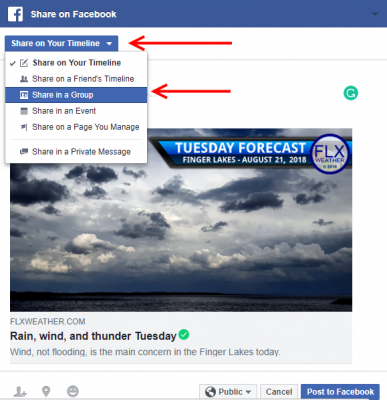 Sharing Finger Lakes Weather with your local Facebook Group is easy! Are you in Facebook Groups focused on your town and community? Community Facebook Groups have become a great resource for locals to share information with their friends and neighbors. 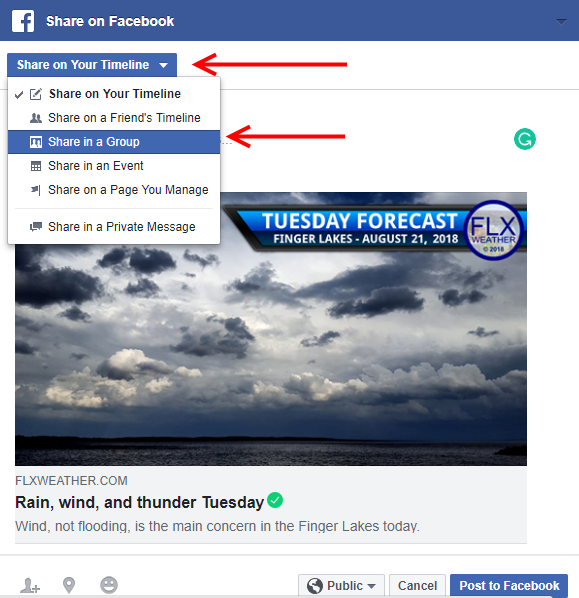 Would you please consider sharing Finger Lakes Weather in one or more of your local groups? Doing so is easy! Just click the Facebook button below, then hit the triangle next to the words ‘Share on Your Timeline’. Select the option to ‘Share in a Group’, type in the name of the group, then hit Post to Facebook! Your help in spreading the word about Finger Lakes Weather is greatly appreciated and allows me to spend my time and money improving Finger Lakes Weather instead of advertising it. Thank you! I just started getting your posts again after a hiatus during your tech changeover. I hadn’t realized how much I missed it and rely on it. So this is just to say thank you! I also just shared it with a FB group. Thank you, Sheila! Sorry about the mix up with the change over…glad to have you back!